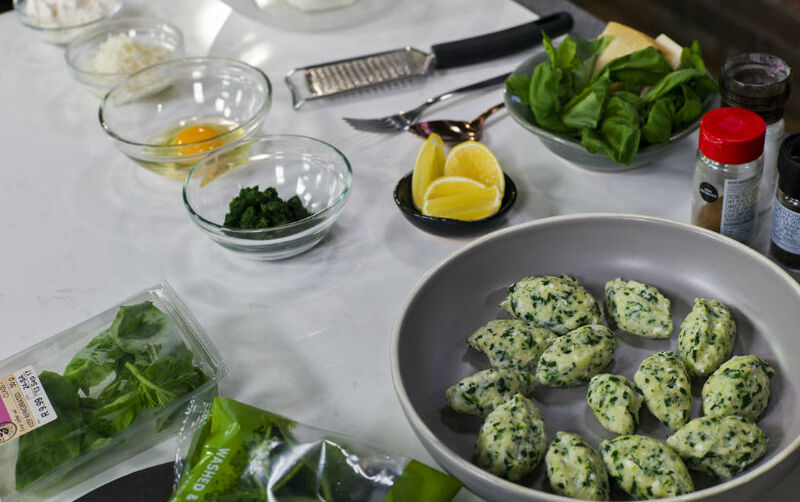 Combine the ricotta, spinach, parmesan, egg and seasoning together with the nutmeg, flour and breadcrumbs. The mixture should come together as a thick paste. Heat a pot of water together with salt until it reaches a gentle simmer. Take a teaspoon of the gnudi mixture into the water to test if the mixture is firm enough. If is breaks up slightly simply mix in another 1T of flour and some more breadcrumbs, giving it a few minutes before testing again. Use 2 tablespoons to mold the mixture into rugby ball like shapes and placing it gently in the simmering water. Allow it to cook for 4 minutes before removing from the water. While the gnudi are cooking heat the butter, olive oil and basil leaves together in a separate pan until the basil begins to pop. Squeeze in the lemon juice and season lightly with salt and freshly ground black pepper. Add the cooked gnudi to the buttery sauce and toss to coat. Add the gnudi to a serving platter and top with parmesan.